The women’s squash team completed a brilliant weekend-long NESCAC run on the weekend of Feb. 8. Heading into the tournament, they were the No. 8 seed and were first matched up against No. 9 Colby. On paper, the Mules’ season has been similar to the Cardinals’: both teams have beaten the same squad, so one could assume it’d be a competitive match. Yet as the day progressed, it was clear that the Red and Black had a special performance coming. Wesleyan routed Colby 9-0 in a complete team victory that showed both the depth of elite talent in the program. At the top of the ladder, Aditi Prasad ’21 delivered a decisive 3-0 win over Colby’s number one, Sydney Annalise Ku. Next, both the two and three on our ladder, Ananya Vir ’21 and Josie Russ ’20, respectively, competed in tight matches that lasted five games, but both Vir and Russ emerged victorious. Wesleyan’s deep roster was in full force, as the bottom of the ladder showed out as well. Ali Imperiale ’19, Sofia Melian-Morse ’20, and Annie Roach ’22 all cruised to convincing 3-0 wins. Overall, the first match was a success for our Cardinals. The Red and Black then had a tough matchup against top-seeded Trinity, a team who has won the tournament each of the past 12 years. Despite Wes’ best effort, Trinity emerged with a victory and would eventually go on to win the tournament once again. 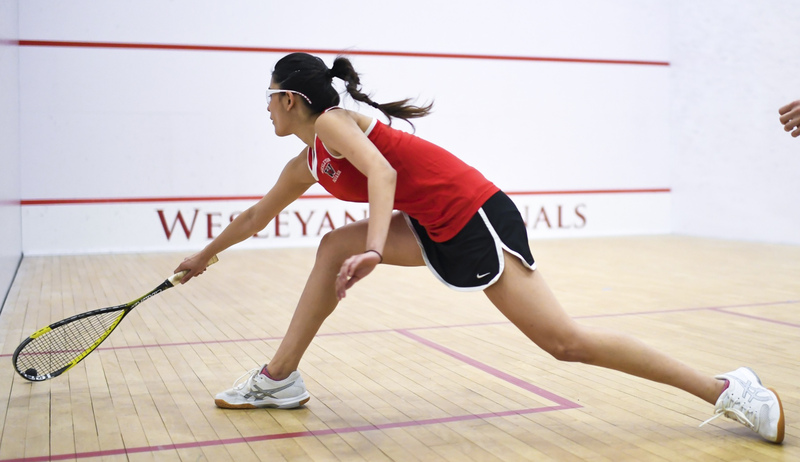 After an exhausting match against Trinity, Wesleyan was put up against Tufts in the same day. With little left in the tank, following a series of long matches, the Cardinals fought hard but were swept by the Jumbos. Senior captain Sarah Clothier noted how the NESCACs are a drill in mental toughness. “I’d say the toughest part of this weekend was pushing ourselves physically and mentally to achieve our goals, all while having four matches in under two days,” Clothier said. Following these two tough losses, many teams would have packed it in for their final match on Sunday against Hamilton. The teams were forced to cancel their match earlier this year, so our Cardinals hadn’t faced them in nearly a year since they eliminated the Continentals in a tight 5-4 matchup. This year No. 9-seeded Hamilton arrived ready for battle but was met with an even fiercer Wesleyan, ready to give everything it had. At the top of the lineup, Prasad once again delivered a key 3-0 victory that set Wesleyan up for success for the rest of the day. Vir, in the second spot on the ladder, dropped her first set but rallied to win the next three, producing a well-earned 3-1 win. Nina Premutico ’20 and Natasha Feenstra ’21 also swept Hamilton from the fourth and fifth slots of the ladder. However, Hamilton showed their grit, winning from 6-8 in the lineup, seemingly setting themselves up for a bottom of the lineup victory against our Cardinals. However, first-year Roach had other ideas. Battling in a four-game spectacle, she sealed the victory for the Cards. Roach also had an insight to share as the NESCACs, the biggest tournament for the women’s squash season, wrapped up. John Vernaglia can be reached at jvernaglia@wesleyan.edu.